Pecan Pie Bars are super easy and delicious. Similar in taste to pecan pie but in my humble culinary opinion, they’re better. Why? Well lets count the ways. Number one, the shortbread crust. I mean, who doesn’t like a buttery shortbread crust! Second, would have to be the chocolate chips, no explanation needed and last, the caramel ice cream topping, one 12 oz. jar to be exact. Growing up in the Upper Midwest, I wasn’t exposed to pecan pie until I was in my late 20’s. This could be for several reasons. The first reason is probably because pecans trees grow generally in the south. Where the weather is warmer than here in Wisconsin. That might also explain why Pecan Pie is traditionally a holiday favorite in the south. But then again, pecans are popular in the south throughout the year. Another reason could be that Aggie, my mom, and America’s worst cook (her words, not mine) probably never thought to use pecans. Walking pass them in the baking aisle at the grocery store, reaching for the bag of walnuts instead. Not to mention the fact that walnuts are generally much cheaper here than pecans are. Or maybe it’s just because Aggie liked walnuts. This native American nut, is a member of the Hickory family. Pecan trees prefer temperate climates and are widely grown in Georgia, Oklahoma and Texas. They can also be found as far north as Virginia. Although pecans can be found throughout the year, their peak season is during the fall. Pecans have a high fat content, over 70 percent. There high fat content invites rancidity and should be stored with care. 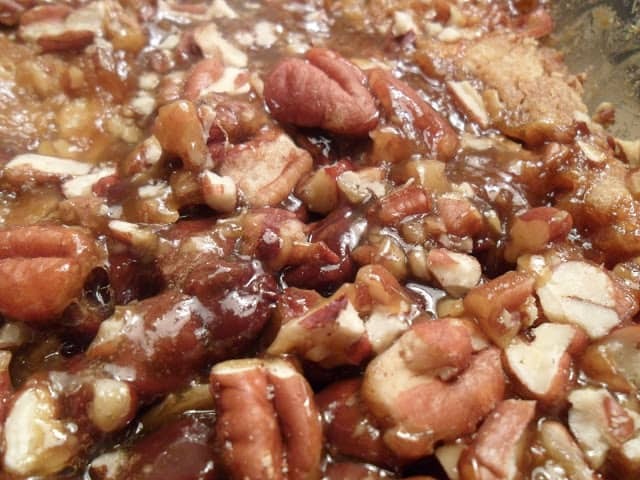 Pecans are favorites for eating out of hand, as well as for using in a variety of sweet and savory dishes. The most well-known pecan dessert is the deliciously rich Southern pecan pie, usually served with a generous dollop of whipped cream. Pecan Pie is unbelievably easy to make. 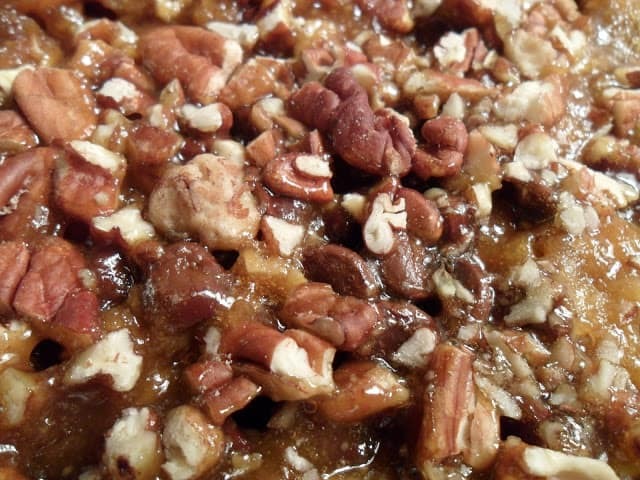 Recipes can be found for different variations of pecan pie. Some recipes call for adding chocolate chips, brandy, maple syrup and/or cream. Pecan Pie Bars are sensational. Fast and easy to make too. In a large bowl combine, 1 cup flour, oats, brown sugar, baking soda, and salt. Stir in butter; mix well. Press into a buttered 13 x 9 baking dish Bake at 350º for 10 minutes or until set. Remove from oven, sprinkle with chocolate chips. Combine caramel ice cream topping and remaining flour until blended, drizzle over chips, sprinkle with pecans. Bake 20 to 22 minutes longer or until bubbly. Cool completely. Cut into bars. Raspberry Jello with Marshmallow Drizzle is a favorite holiday jello salad that we love. Made with applesauce, frozen raspberries, thawed and topped with a sensational marshmallow drizzle.